With March Madness officially over, people can turn their attention to the warmer weather slowly creeping across the U.S. With rising temperatures, 25% of people surveyed stating they would be spending more money than previous months on home improvement projects; which is excellent news for those in the hardware, remodeling, and landscaping businesses. The apparel, electronic, and furniture industry will not see the same rewards as their hardware counterparts. Be sure to bookmark the next page to skip re-entering this information on your next visit. 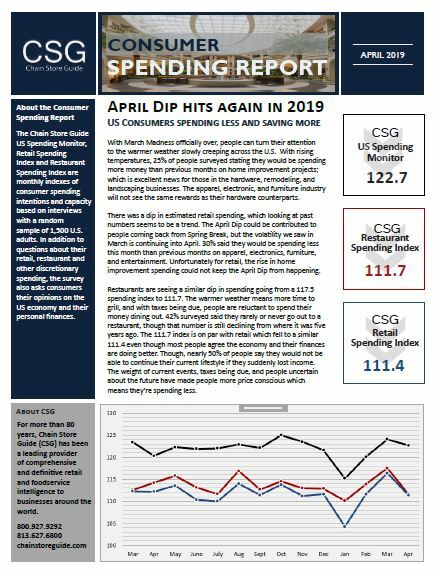 The CSG US Spending Monitor, Retail Spending Index, and Restaurant Spending Index are monthly indexes of consumer spending intentions and capacity based on interviews with a random sample of 1,500 U.S. adults. In addition to spending, the survey asks consumers their opinions on the U.S. economy and their personal finances, retail and other discretionary spending. The Monitor began in January 2014 with a base index of 100. CSG captures a unique view of consumer, retail, and foodservice spending intentions. The CSR includes the CSG US Spending Monitor, which tracks economic confidence and spending intentions of US consumers, the CSG Restaurant Spending Index, which measures consumer spending intentions for restaurant purchases, and the CSG Retail Spending Index that measures consumer retail and discretionary spending confidence. The CSR will be available to all customers this summer delivered on a monthly basis. If you would like to receive the CSR report in your email, fill out the form to the left.